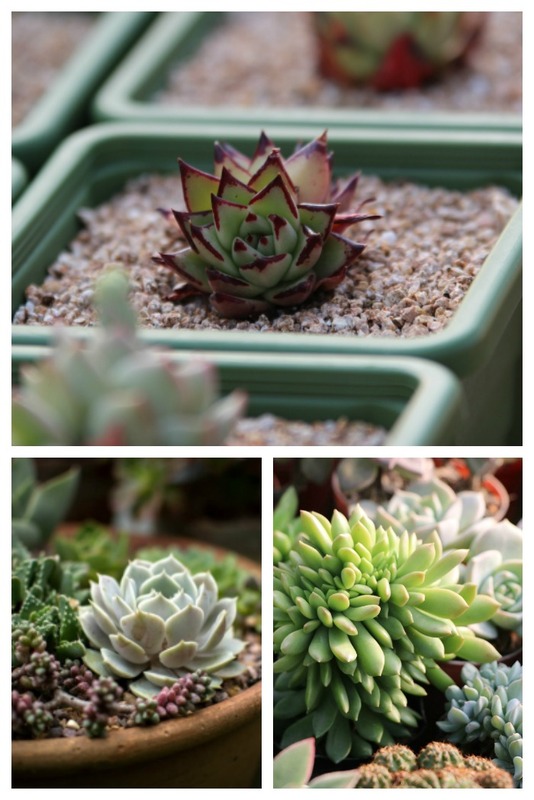 Confused about what to look for when buying succulents? This guide will walk you through the process and give tips on what to look for and what to avoid. 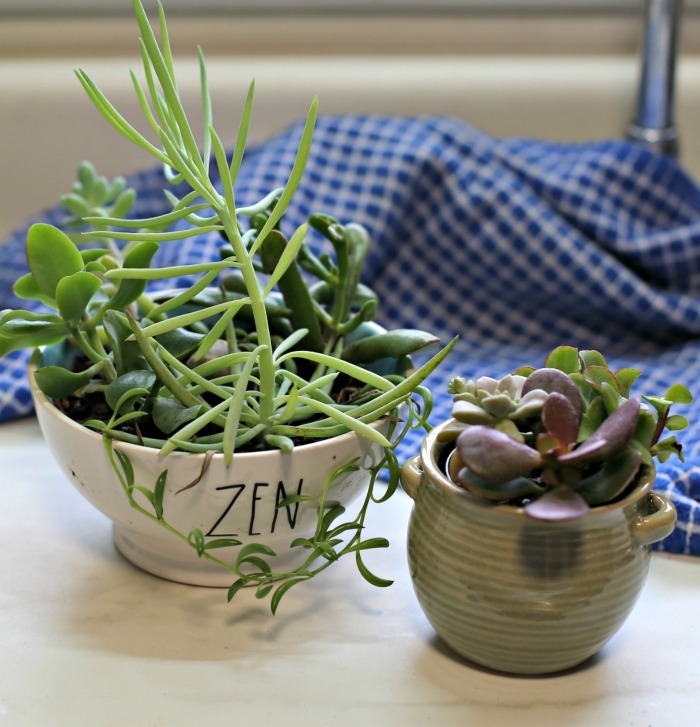 Succulents are easy care houseplants (or outdoor plants) that even those with a brown thumb can grow. They require very little water and can tolerate the dry conditions that are present in many homes. What used to be an overlooked plant specimen that you might find if you were lucky when shopping, is now a trendy plant that people use for indoor decorating, as wedding favors, or bouquets, and so much more. 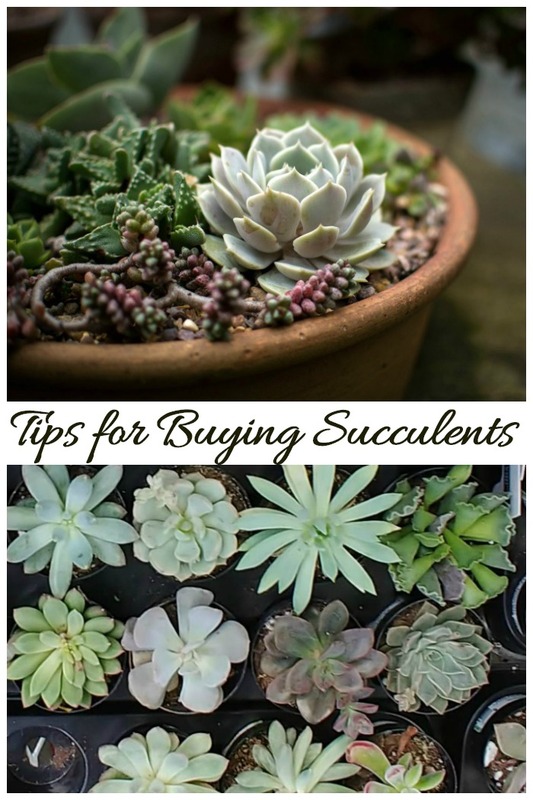 But before you can grow succulents, you need to know what to look for when you are shopping. There is no point in purchasing a large agave plant best suited to a hot, dry outdoor location if a small sedum or echeveria that needs to be grown indoors in most hardiness zones is what you really need. 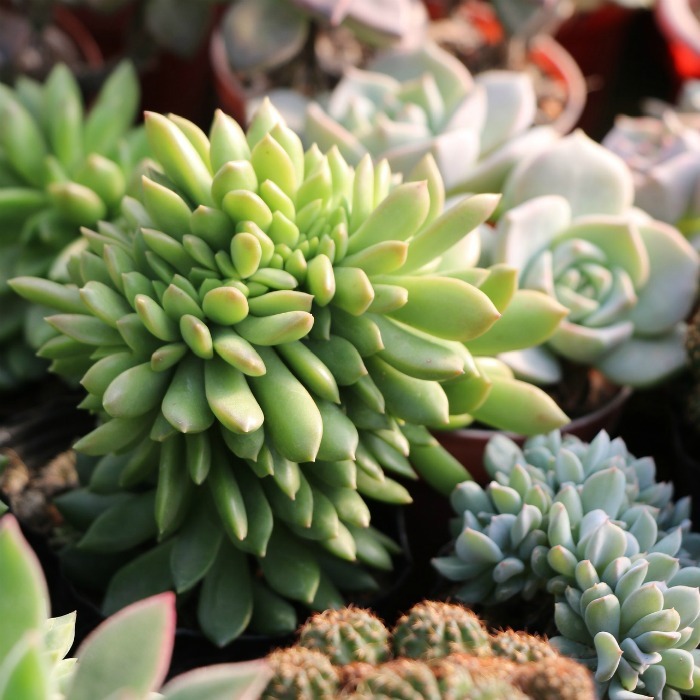 Before you can start growing succulents, you’ll need to know what to look for when you shop for them and where to find succulents for sale. If possible look for plants with more than one plant in a pot. These can be separated into several containers, so you get more bang for your buck! Who doesn’t like plants for free? 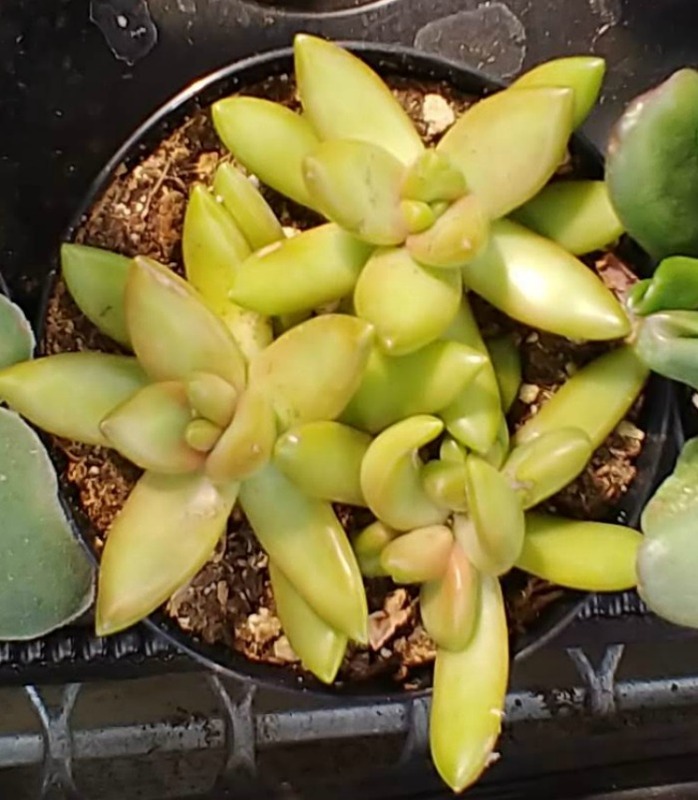 Since this type of plants grows so well from succulent cuttings, it’s likely that the specimen you plan to buy has been started in this manner. But a tiny piece of leaf that has grown a tiny baby might also have a very small root system. In the photo below, the lithops plant on the left has a firm solid root ball. This means the plant is very established. The succulent on the right has roots but the soil falls away from the roots. This plant will spend more time putting out roots and not grow as quickly. So the established plant will be more successful for you. Check for loose soil in the pot and if possible turn the pot upside down and pull the plant out to see how developed the root system is. If you end up with a handful of dirt, replace the plant and choose another that will be more developed and easier to grow. While most succulents survive well in a sunny spot with little maintenance, some are better suited to the outdoors than growing indoors as houseplants. 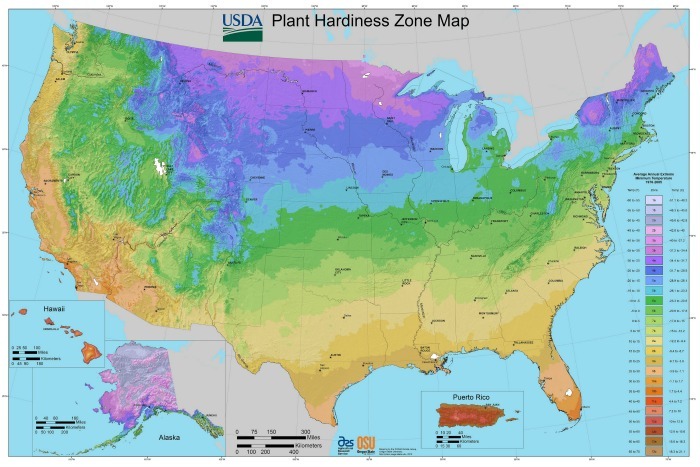 For any plant that you want to have outdoors during the winter, it is necessary to know your hardiness zone. This, along with information on plant tags, will tell you if it’s possible to keep the plant outside when it gets cold. I tend to grow all of my succulents outdoors in the summer time and bring many of them indoors in the winter months, when the temperatures here in NC are a bit too cold for most of them. 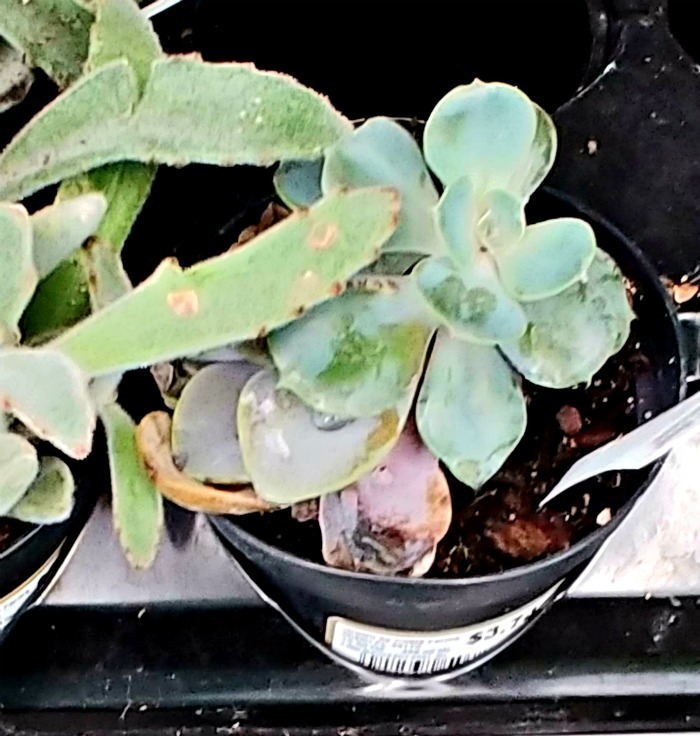 If this is something you like to do also, be sure to check out this succulent hardiness zone chart which will tell you what your location is likely to get for winter temperatures. It is absolutely necessary, when buying succulents, to know where you plan to have your plant located. You can’t put tender succulents outdoors in an open area and expect them to live when it snows or when the temperatures will scorch them. Check your plant tags or card descriptions. 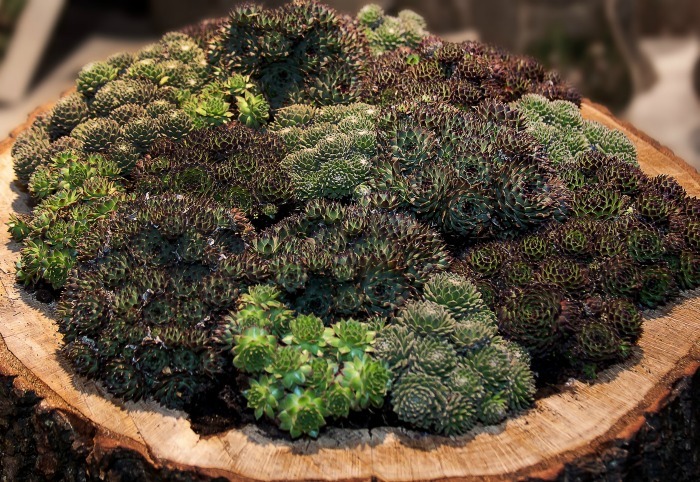 Hardy succulents are those that can take temperatures below freezing and down to about -20 º F.
These tough guys can be grown outdoors in many hardiness zones. Sempervivums (Hens and Chicks) and Stonecrop Sedums fall into this category. 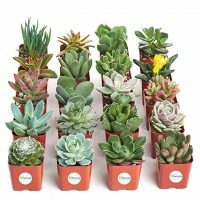 Most of the small plants that you find for sale at normal garden centers and big box hardware stores will be the tender succulent type. 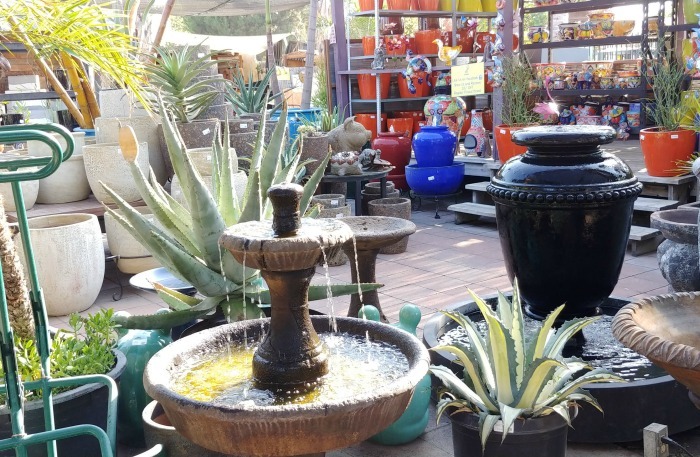 Sometimes, you will find good prices on several types of succulents in one container. 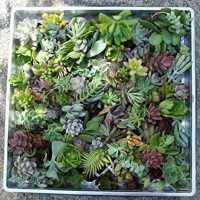 I’ll often take apart the container and pot up each plant in its own container, and I also use broken leaves and tip cuttings to propagate the plants into new succulents. The small ceramic garden on the right is one that has four small rooted plants as well as the container. For $6.98 I could not pass it up. Individual succulents, even plugs, can cost $2.99 or more each, so it was a bargain! I’ll take apart the small plants and use them in a larger bowl arrangement and I’ll still have the small ceramic planter (with a drainage hole!) for a single pretty succulent variety. If you like the look of a mixed garden, be sure that the container either has a drainage hole in the bottom of the pot, or a layer of gravel or rocks on the bottom of the container if it has no drainage. Succulents do not need a lot of water and, without proper drainage, the succulent garden will soon be a soggy mess. 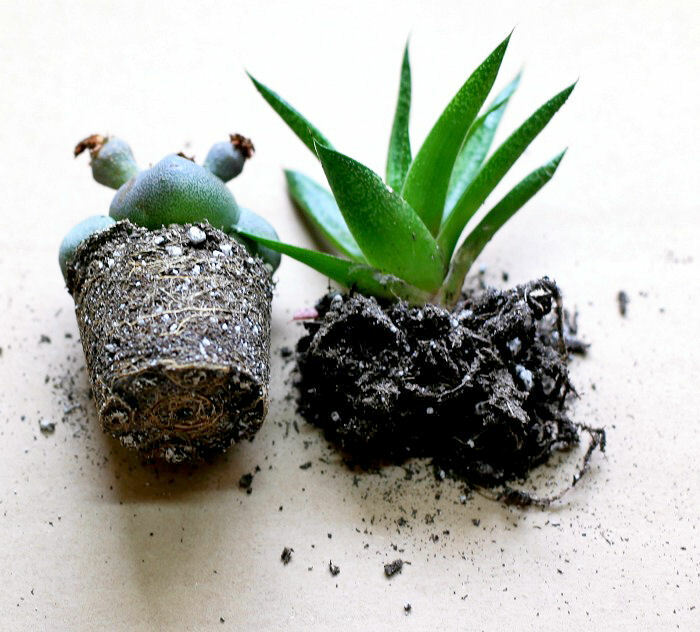 Succulents are generally small plants with a shallow root system. For this reason, the pots that they come in are often quite small. For succulent gardens with mixed plants in one pot, look for wide, shallow containers. Even something as simple as a tea cup (with some gravel for drainage) will act as a planter. 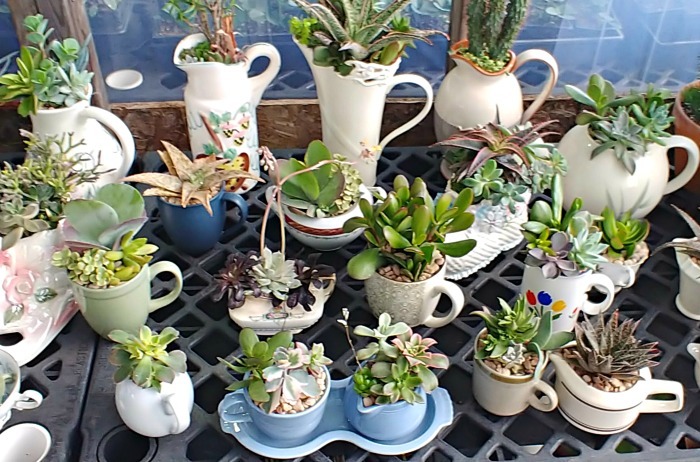 One thing I love to do is to purchase succulents in small pots, to get the best price and then keep my eye out for interesting small containers to use as pots for succulents to display them. Need some more inspiration? Check out these unusual succulent containers. What size succulent should I buy? Succulents come in all sorts of sizes. You can purchase them in tiny 2 inch pots with a small price tag, or in large designer tubs with a price tag to match. Larger plants are more established and easier to care for. They don’t dry out as quickly, so this means that you won’t have to water as often. Plants in the teeny tiny pots are slow growing but the size of the pot means that you will be watering much more often. Choose depending on the amount of space you have to display them and how much time you want to devote to their care. If your plan is to create a succulent garden, the smaller plants are the way to go. You can put several of them into even a small container. 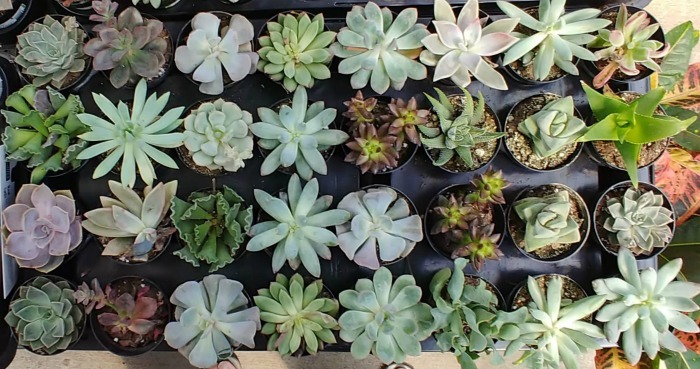 Succulents love the heat but their growth is actually slower in the summer months. Watering them in the very hot summer can be tricky for beginners. Winter is also a time when those new to growing succulents have problems since freezing temperatures can damage or kill them. If you shop for succulents during the warmer (but not hottest) months, you will find that most stores have a better choice and healthier plants, since the turn over on them is higher then so the supply i always fresh. Spring and fall are the growing seasons for succulents and this is a good time to purchase them. It gives you a chance to get use to their care before either the very hot or very cold weather arrives. There are lots of places that have succulents for sale. How available they will be to you depends on where you live and the size of your town or city. My local Farmer’s Market is a wonderful place that has succulent plants for sale. 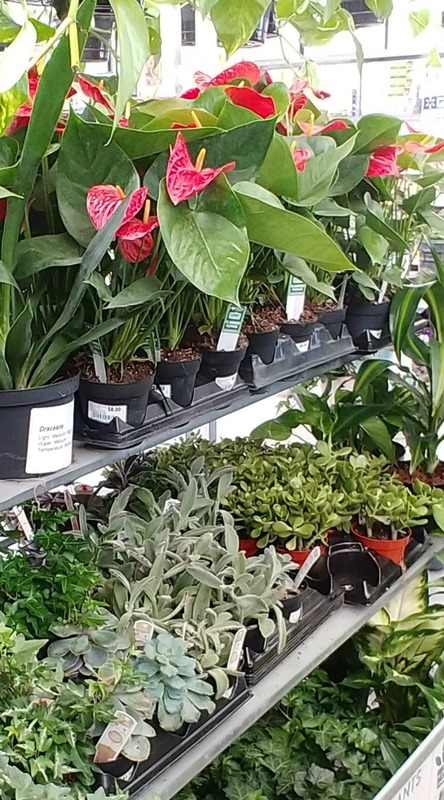 There are at least a half dozen different stalls who have them for sale and I can often find unusual varieties that are not commonly seen in big box stores. Prices at the Farmer’s Market are likely to be a bit more expensive, but the plants will likely be good sized specimens that are well cared for by people who grow the plants themselves. 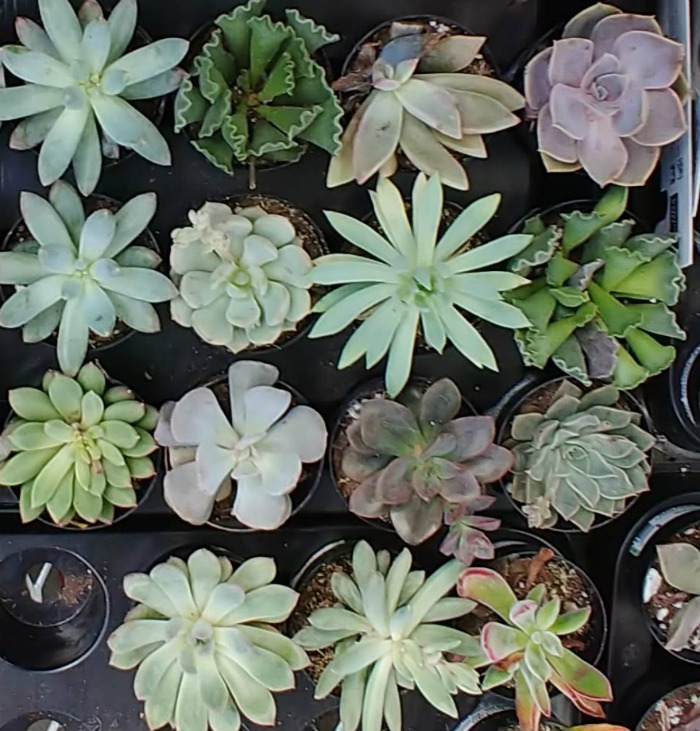 I spent a few weeks with my daughter in California last summer and had a great time exploring succulent stores with her. Buying succulents in a store devoted to just succulents and cacti was amazing and the prices were reasonable, since succulents are so plentiful in California. 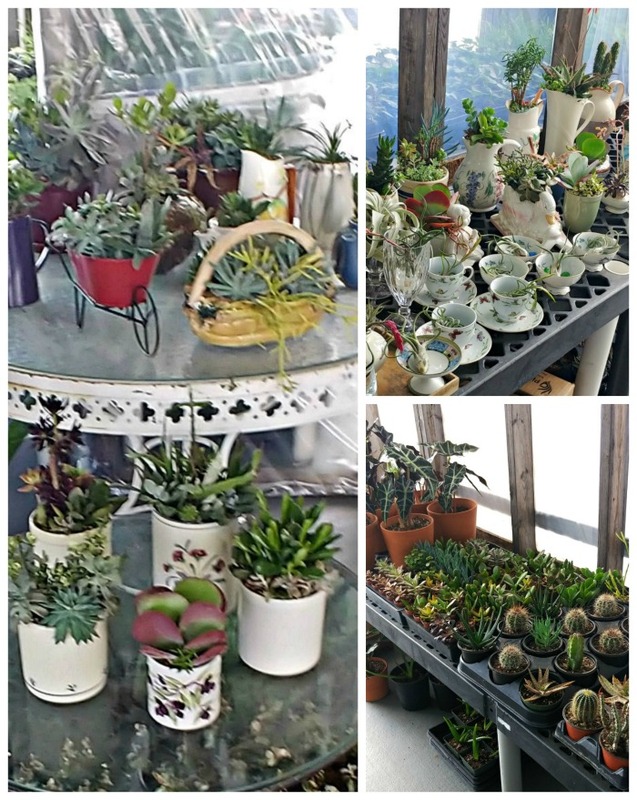 Not only did the stores have a great selection of different succulents, they also had wonderful containers for them. Be sure to check your local garden centers, as well. More and more of them are stocking a nice variety of succulents. My local big hardware stores normally have a great range of succulents year round in the indoor area of the garden center. While both stores stock succulents, my preference is for Home Depot. The supply and variety seems to be better and the plants also seem better cared for. The range of varieties seems to be improving all the time, showing just how popular succulents are with gardeners. Be careful with container gardens. I’ve seen some which have small rocks actually glued to the top of the soil as a means of presentation. I’m not sure how they think customers will be able to water them efficiently with a layer of solid rocks on the top. The garden centers of Walmart stores have a pretty good range of succulents at inexpensive prices. The variety is so-so in my local Walmart stores and the quality can be suspect at times too, but you can’t beat their prices. My experience has been that Walmart’s range of plants is hit or miss in the colder months. Shop in spring and summer for best selection. I also noted that the succulents (which need hot dry conditions) and the tropical plants (which need humidity) were lumped together at Walmart. Not the best for optimal growing conditions! 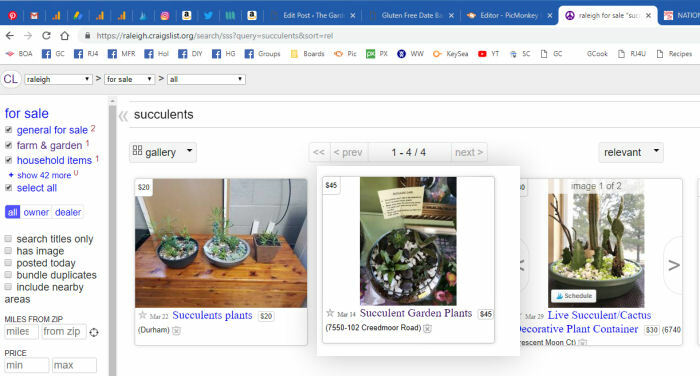 In the spring, here in Raleigh, there are many private sellers who have quite a nice range of succulents plants in the spring months. The prices are very inexpensive, with most of the sellers having plants that they have grown from cuttings. You won’t be able to get the most rare varieties, in most instances, and the choices could be picked over before you arrive to look at them, so shop early in the day. The day I looked on Craig’s list, there were a limited amount of choices, but it’s still early here, so the range will be greater in a few weeks. Where can I buy cacti and succulents online? 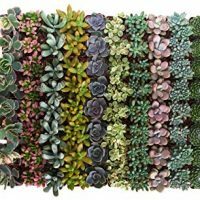 One of the best things about buying succulents online is the great variety of succulents that you will be able to find. 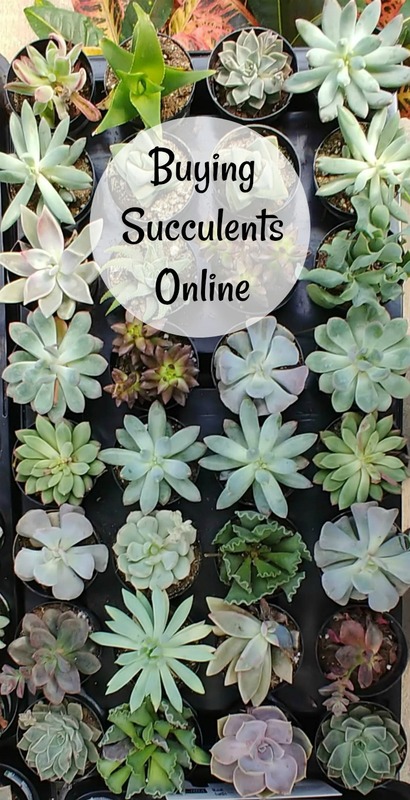 Most online sellers are experts in the field of succulents so you will often get a better, more healthy specimen. Online sells also ship right to your door, saving you then time to have to go out on a shopping trip. Of course, there are some downsides to buying succulents online. There is no way to choose your own specimen and plants can sometimes be damaged in the course of shipping. Be sure to choose places with a good guarantee. Online prices can also be significantly higher than buying locally. If you decide to purchase succulents from online sellers be sure to choose companies with high quality reviews. A word on online reviews. Look for a good ratio of mainly positive to negative reviews. Many people leave bad reviews for reasons that are not fair (in my opinion). Getting dead or dying plants is worth giving one star to a seller. Planting tender succulents outdoors in the winter and having them die because you didn’t do your homework is not. The Facebook Marketplace is a convenient online destination on Facebook where you can browse to discover, buy and sell items with people in your local community. 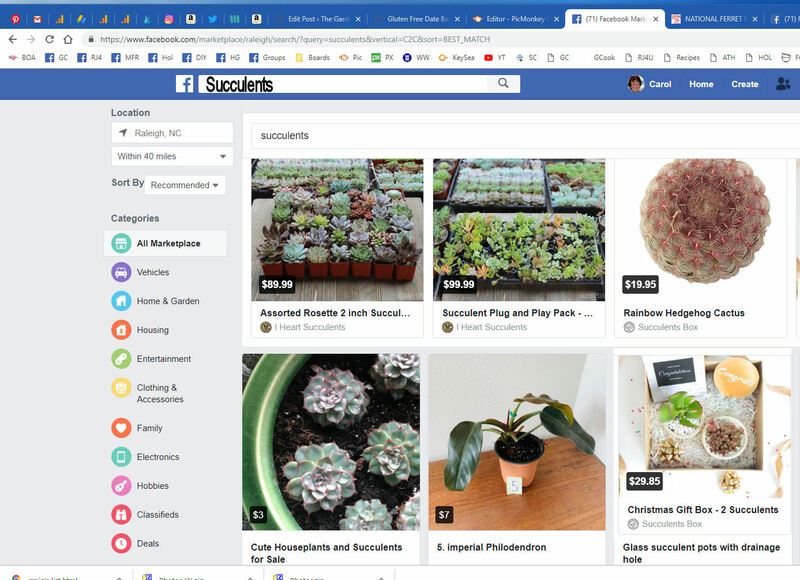 There are some retail sellers in the Marketplace who have succulents at full retail prices, but there are also individual sellers who price much below the normal retail prices that you will find in stores. It’s worth a look to see what is available locally but by browsing online first. Would you like a reminder of this post for tips for buying succulents? Just pin this image to one of your Pinterest gardening boards so that you can easily find it later. There are many things to be aware of when you are shopping for succulents. These tips will make your shopping trip a success. 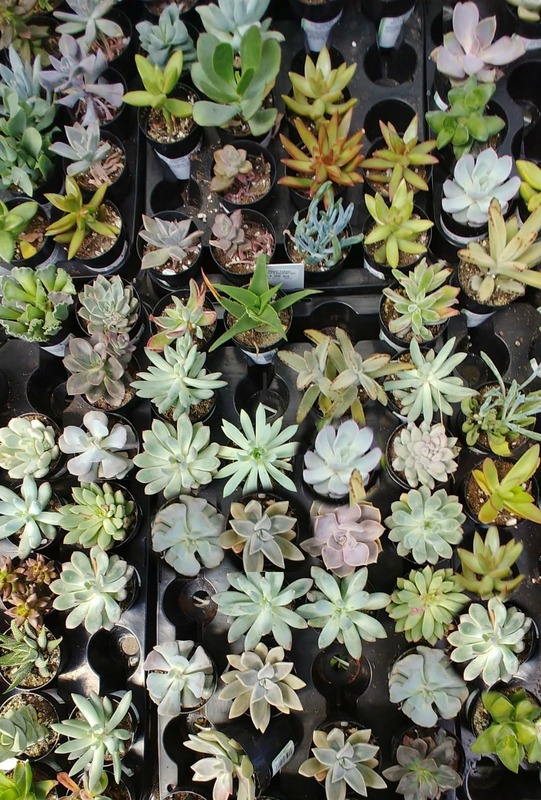 Print out this list of tips and take it with you on your next succulent shopping trip. See links to the websites in the post above. Check ratings and reviews before purchasing and look for a good guarantee.